Fig. 4. Synthesis of novel mismatch recognition agent, bis(2,2'-bipyridyl)(5,6-chrysenequinone diimine)rhodium(III), [Rh(bpy)2(chrysi)]3+. to a round-bottomed flask. Glacial acetic acid is then added and the solution is brought to reflux while stirring. As heating continues, the solution changes from the orange/yellow of the dichromate/chrysene to deep green with orange/red crystals of the chrysenequinone product. The mixture is refluxed for 9 hr. After the reaction mixture is removed from the heat, 75-100 ml of boiling water is immediately added. The product quickly precipitates while the green chromium by-products remain soluble. The solution is filtered to collect the product that is then thoroughly washed with water. Recoveries at this step are typically 80-90%. To purify the product away from any remaining chromium by-products or any present unreacted chrysene, it is recrystallized from ethanol. The product should be characterized by NMR, HPLC, and mass spectrometry. Finally, chrysenequinone is dissolved in the acetonitrile portion of what will be a 3 :1 (v/v) acetonitrile-0.1 AiNaOH solvent system. The [Rh(bpy)2(NH3)2]Cl3 is dissolved in the 0.4 M NaOH aqueous portion and added to the chrysenequinone solution. The formation of the diimine product gradually changes the red/orange of the quinone solution to a dark brown. After the reaction is complete (approximately 8 hr), purification is achieved via cation-exchange chromatography, eluting with 0.15 M MgCl2.22'29 The product should be characterized by 'H NMR, UV-Vis, HPLC, and mass spectrometry. 29 I. P. Evans, G. W. Everett, and A. M. Sargeson, J. Am. Chem. Soc. 98, 8041 (1976). Probing Nucleic Acid Structure with Rhodium Reagents. The rich photochemistry of rhodium allows the straightforward identification of sites of binding by light-induced DNA cleavage. 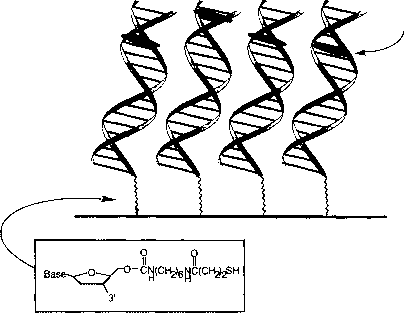 In the procedures described, end-labeled DNA is incubated with a transition metal reagent and then irradiated with visible light to promote cleavage of the nucleic acid. Local destabilizations in helix structure can thus be identified and analyzed. The DNA samples used in these studies have been made synthetically using standard techniques or excised from plasmids using restriction endonucleases. All samples were labeled with [32P]phosphate on either the 5' or 3' end by enzymatic methods. Although the exact photolysis procedures that will be optimal under any given set of experimental conditions depend on the individual light source used, the following description includes many of the possible options commonly used in standard laboratories. The typical light source in our laboratory is a Thermo Oriel (Stratford, CT) mercury/xenon arc lamp equipped with an infrared (IR) filter, monochromator, and UV (A. < 300 nm) cutoff filter. Other sources used for these experiments have included a helium/cadmium laser (model 4200 NB, 442 nm, 22 mW; Linconix, Sunnyvale, CA) and a transilluminating light box (Spectro-line model TR302 with broadband irradiation centered at 302 nm; Spectronics, Westbury, NY). Equal volumes of the metal and DNA stock solutions are combined in a microcentrifuge tube, agitated, and centrifuged. Solutions are allowed to equilibrate for 5 to 15 min in the absence of light before irradiation. Total volumes are usually between 5 and 50 ¡A containing between 10,000 and 200,000 cpm of the end-labeled DNA. Total DNA concentrations are typically between 5 and 100 ¡iM base pairs, depending on the binding constant of and its concentration relative to DNA for the chosen metal complex. Dark and light controls of each DNA of interest are run in parallel; the light control has no metal complex added and the dark control is not exposed to light. Samples are irradiated by positioning the open tube in the output of the light source as close as possible to the focal point for between 5 and 30 min. The exact irradiation time depends on the strength of a given light source and the wavelength of irradiation. When a given source or wavelength is first used for an experiment, an irradiation time series should be performed to select the optimal irradiation time. In our experiments, the optimum wavelength for [Rh(bpy)2chrysi]3+ is 440 nm. After irradiation, all samples are stored in the dark until the completion of the experiment. DNA is isolated from solution either by drying the samples or by ethanol precipitation. Samples are typically dried on a Speed-Vac concentrator (Savant, Hicksville, NY) or precipitated by addition of 1-5 ¡x\ of 9 mM calf thymus DNA, a 1/6 to 1/4 volume of 7.5 M ammonium acetate, and 4 volumes of absolute ethanol. The precipitates are mixed well and incubated on dry ice for 30 min before centrifuging at 14,000 rpm for 12 min on an Eppendorf centrifuge. The resulting pellets are rinsed with cold ethanol, dried in vacuo, counted on a scintillation counter, and resuspended in gel dye to a constant concentration of radioactivity before electrophoresis. Standard DNA-sequencing electrophoretic techniques are used to identify cleavage sites on the DNA. Photocleavage samples are extracted into denaturing loading dye and electrophoresed in Tris-borate-EDTA (TBE) buffer on 8 to 20% (w/v) denaturing polyacrylamide gels. The samples are heated to 90° for 5 min before loading to promote denaturation of the DNA strands and dissociation of the metal complex probes. Sites of [Rh(bpy)2(chrysi)]3+ binding are indicated by cleavage bands in the experimental lanes. To identify the specific sites of nucleic acid cleavage, samples are run adjacent to samples of the same DNA strand that have been chemically sequenced using standard Maxam-Gilbert sequencing reactions. Gels are read using standard autoradiography and phosphorimagery techniques. Single-Mismatch Detection in a Kilobase Linearized Plasmid. To test recognition of a single-base pair mismatch in nonsynthetic kilobase DNA samples, experiments with plasmids can be performed. In our experiments, each plasmid contained an oligonucleotide segment (57 bp) inserted between the Sail and Hindlll sites in the polycloning site of pUC19. The inserts differed in only one base pair to produce plasmids with either a cytosine (pVYAc) or a guanine (pVYAo) at position 467 (as numbered from the first base pair of pUC19). In our experiments, samples of pVYAc and pVYAG were linearized with Seal and dephosphorylated with shrimp alkaline phosphatase. After ethanol precipitation, samples of each plasmid were combined and denatured by addition of 10 M NaOH. After incubation for 5 min, the samples were neutralized with acetic acid, and sodium chloride and buffer (Tris, pH 8.5) were then added. The samples were then annealed via 30-min incubations at 65 and 37°. This mixture of heteroduplexes was desalted and extracted into 10 mM Tris buffer (pH 8.5) on a Microcon-10 spin filter (Millipore, Bedford, MA). Samples were then end labeled (on both ends of the plasmid) with [32P]ATP and polynucleotide kinase (PNK). Stocks of labeled plasmid for photocleavage were prepared from 2 fig of the labeled plasmid in 100 fil of 2x running buffer (100 mM Tris, 40 mM sodium acetate, 36 mM NaCl). Portions of the plasmid stocks (10 fi\) were combined with equal volumes of solutions of A-[Rh(bpy)2(chrysi)]3+ (200,20, 2, or 0.2 nM) at least 20 min before irradiation for 10 min at 440 nm. Samples were extracted into 1 volume of alkaline agarose loading dye [50 mM NaOH, 1 mMEDTA, 2.5% (v/v) Ficoll, 0.25% (w/v) bromocresol green] and run on an alkaline agarose gel [1% (w/v) agarose, 50 mM NaOH, 1 mM EDTA). The gel was fixed in 7% (v/v) trichloroacetic acid, dried in vacuo, and visualized by phosphorimagery. and [32P]ATP. The labeled plasmid was subsequently exposed to PvmII, yielding three restriction fragments. The fragment of interest (270 base pairs) was run on a 6% (w/v) nondenaturing polyacrylamide gel and isolated by extraction into ammonium acetate buffer followed by ethanol precipitation. 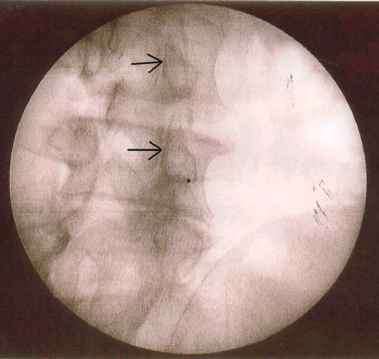 Samples of the labeled restriction fragments were combined with a large excess of either pVYAo or pVYAc that had been treated with both £coRI and Pvull. This mixture of labeled 270-mer and the three unlabeled fragments resulting from the double digests was denatured and reannealed as described above. Samples of these DNA solutions were diluted in 2x running buffer and mixed with an equal volume of A-[Rh(bpy)2(chrysi)]3+ solution 10 min before irradiation at 440 nm for 10 min. Samples were dried, extracted into formamide loading dye, and loaded on a 6% (w/v) denaturing polyacrylamide gel. After drying, the gel may be visualized by phosphorimagery. The study of DNA-mediated electron transfer has been of great interest. Although the finer kinetic and mechanistic issues surrounding DNA-mediated electron transfer are still being debated, it has become apparent that these reactions are extremely sensitive to DNA ^-stacking.30"38 The importance of the stacking of the electron donor and acceptor within the DNA base stack was highlighted in studies involving photoinduced electron transfer between modified bases in DNA.31 DNA-mediated electron transfer is also highly dependent on the stacking of the base pairs intervening the donor and acceptor.30-38 Base bulges,36-37 flexible sequences,39'40 and protein-induced distortions41 all greatly influence the efficacy of long-range DNA-mediated electron transfer. 30 S. O. Kelley, R. E. Holmlin, E. D. A. Stemp, and J. K. Barton, J. Am. Chem. Soc. 119,9861 (1997). 31 S. O. Kelley and J. K. Barton, Science 283, 375 (1999). 32 R. E. Holmlin, P. J. Dandliker, and J. K. Barton, Angew. Chem. Int. Ed. Eng. 36, 2714 (1997). 33 S. M. Gasper and G. B. Schuster, J. Am. Chem. Soc. 119, 12762 (1997). 34 C. J. Murphy, M. R. Arkin, Y. Jenkins, N. D. Ghatlia, S. Bossmann, N. J. Turro, and J. K. Barton, Science 262, 1025 (1993). 35 S. O. Kelley and J. K. Barton, Chem. Biol. 5,413 (1998). 36 D. B. Hall and J. K. Barton, J. Am. Chem. Soc. 119, 5045 (1997). 37 D. B. Hall, R. E. Holmlin, and J. K. Barton, Nature (London) 382, 731 (1996). 38 D. T. Odom, E. A. Dill, and J. K. Barton, Chem. Biol. 7,475 (2000). 39 T. T. Williams, D. T. Odom, and J. K. Barton, J. Am. Chem. Soc. 122,9048 (2000). 40 M. E. Nunez, D. B. Hall, and J. K. Barton, Chem. Biol. 6, 85 (1999). 41 S. R. Rajski, S. R. Kumar, R. J. Roberts, and J. K. Barton,,/. Am. Chem. Soc. 121, 5615 (1999). 42 W. N. Hunter, G. A. Leonard, and T. Brown, ACS Symp. Ser. 682, 77 (1998). 43 B. A. Luxon and D. G. Gorenstein, Methods Enzymol. 261,45 (1995). 44 J. E. Forman, I. D. Walton, D. Stern, R. P. Rava, and M. O. Trulson, ACS Symp. Ser. 682,206 (1998). 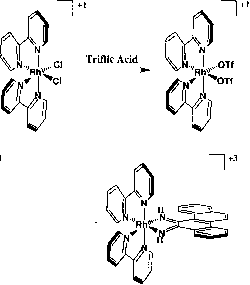 45 N. Peyret, P. A. Seneviratne, H. T. Allawi, and J. SantaLucia, Biochemistry 38, 3468 (1999). 46 J. SantaLucia, Proc. Natl. Acad. Sci. U.S.A. 95, 1460 (1998). 47 S. O. Kelley, N. M. Jackson, J. K. Barton, and M. G. Hill, Bioconjug. Chem. 8, 31 (1997). 48 S. O. Kelley, J. K. Barton, N. M. Jackson, L. D. McPherson, A. 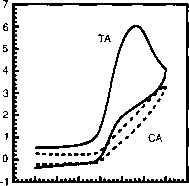 B. Potter, E. M. Spain, M. J. Allen, and M. G. Hill, Langmuir 14, 6781 (1998). 52 S. Mui, E. M. Boon, J. K. Barton, M. G. Hill, and E. M. Spain, unpublished results (2001). Fig. 5. Schematic representation of a DNA-modified gold electrode with a bound redox-active DNA intercalator for use in electrochemical assays. Fig. 6. Schematic representation of the efficacy of electron transfer in well-matched and mismatched duplexes. In mismatched DNA, base stacking is locally perturbed at the site of the mismatch and electron transfer is shut off. modified electrode. Electrons flow from the electrode surface to intercalated MB+. 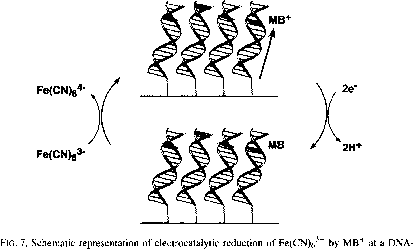 Once reduced, MB can easily reduce Fe(CN)63~ and regenerate MB+ that can continue on in the catalytic cycle, and thus repeated interrogation of the DNA monolayer is achieved. MB+ binding is primarily constrained to the top of the densely packed DNA monolayer, requiring charge transport through the DNA film, and electrostatic repulsion keeps Fe(CN)63- away from the interior of the anionic DNA film. Strategy for Construction of Thiol-Modified DNA. All reagents and solvents are purchased in their highest available purity and used without further purification. Millipore Milli-Q (18 Mi2 cm) water is used in all experiments. All glassware and plasticware is DNase, RNase, and metal free. Oligonucleotides are derivatized with alkane thiol linkers for self-assembly on gold surfaces (Fig. 5). The length of the oligonucleotide can be varied. The oligonucleotides are synthesized (trityl-off) at a 1-yimol scale on a DNA synthesizer using standard solid-phase phosphoramidite chemistry (1000-A CPG). After the synthesis the DNA is still on the resin and fully protected with the exception of the 5'-OH terminus. This solid-phase DNA is transferred to a peptide reaction vessel (coarse frit). The 5'-OH is aminoacylated by reaction with carbonyldiim-idazole (CDI) in dioxane (25 mg of CDI in 1 ml of dioxane for 45 min). After this activation reaction, a six-carbon amine-terminated linker is added by reaction with 1,6-hexanediamine in 9:1 dioxane-water (32 mg of linker in 1 ml of dioxane mixture for 25 min). This product is transferred to a 1.5-ml Eppendorf tube. The DNA-5'-NH2 is cleaved from the CPG resin and all the bases are deprotected by incubation in 1 ml of concentrated NH4OH at 55° for 8 hr. The DNA-5'-NH2 product is then cooled, decanted, and evaporated to dryness in vacuo. This product is purified by reversed-phase HPLC on a Cj8 300-A column with a gradient of 0-13% CH3CN in 35 min, 13-50% CH3CN in 50 min with ammonium acetate, pH 7, as the aqueous phase (monitored at 260 and 290 nm). This purified DNA-5'-NH2 product is dried in vacuo.